With the outbreak of World War II, the Catholic Church in America declared their support to the American war effort. 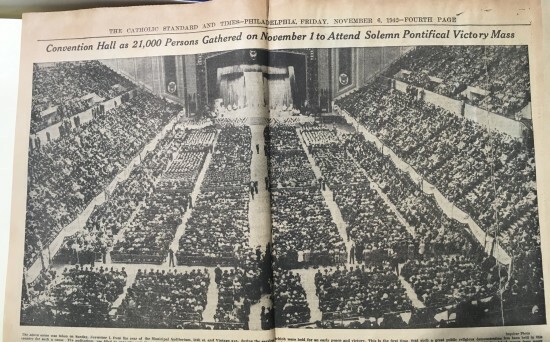 Nowhere was this more evident than in Philadelphia, when Cardinal Dougherty held a Mass to “obtain from the mercy of God our country’s victory.” The Mass was scheduled for November 1, 1942 at Convention Hall, with Dougherty requesting 200 people from each parish attending. Simultaneous Masses were also held throughout the far reaching parishes for those who were unable to make the journey into the city. Since the logistics for organizing this Mass were very involved, Dougherty requested $100 from each parish to offset the expenses. On the day of the Mass, over 21,000 people were crammed into Convention Hall, with three overflow Masses occurring around the Hall for those who could not fit inside. Since the Mass would be seen as speaking for all Catholics in America, many U.S. officials were invited, including President Franklin D. Roosevelt. 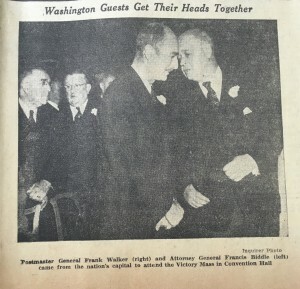 While Roosevelt could not attend the Mass, other high level officials came, including Justice Owen Roberts, Postmaster General Frank Walker, Attorney General Francis Biddle, and Admiral Milo Draemel. At the Mass, Cardinal Dougherty gave a speech, which was broadcasted on the radio around the world. This made its message of support for the Allied forces and categorically condemning Nazi Germany even more impact as it had global influence. 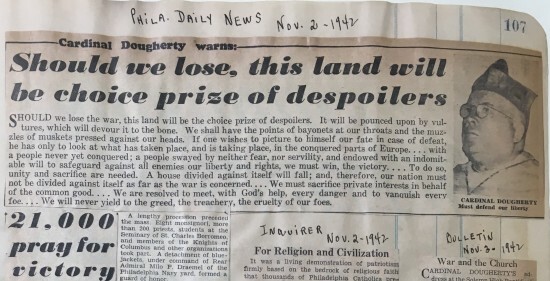 During the speech, Dougherty declared that “should we lose the war… [the country] will be pounced upon by vultures, which will devour it to the bone.” He continued stating that “we must win, we will win” and that the armed forces risked their “lives in the sacred cause of religion and civilization.” This is important because it frames the war not simply as defending against an aggressor but rather as a just war preventing the destruction of humanity. 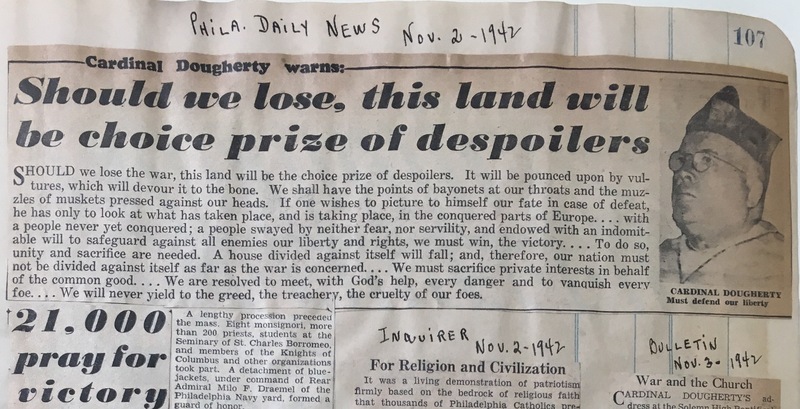 After Dougherty gave his speech, he was followed by Most Reverend Hugh Lamb, Auxiliary Bishop of Philadelphia, who echoed Dougherty’s sentiment by stating that “we have gathered to pray to God for the victory of our cause and for a just and lasting peace.” Lamb continued and declared that without Divine help victory would not be possible and that the only way to gain His mercy was by having lives pleasing to God. However, Lamb believed that it was “futile for us to make America worthy of God’s blessing,” since “many have forgotten the God of their fathers and have become worshippers at the shrine of materialism.” It is interesting that at a time when national unity was needed, Lamb was calling out those who have lapsed in their faith. By doing so, Lamb was laying any possible defeat at their feet for losing God’s favor and at the same time making sure that Catholics saw their faith as an integral part of the war effort. Another aspect of the ceremony was presenting President Roosevelt with an illuminated scroll and bible. 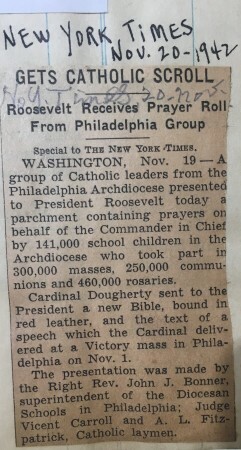 These were given to Roosevelt by Msgr. John Bonner a short time after the Mass. 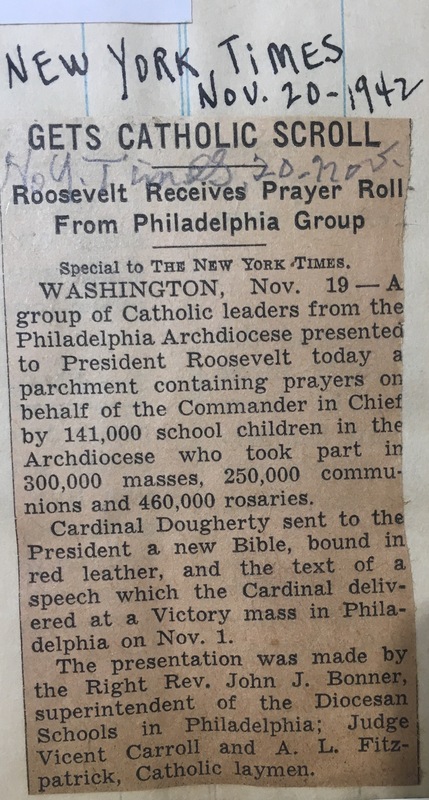 The scroll detailed a project in which the over 140,000 school children of the Archdiocese of Philadelphia gave prayers to help the president throughout the war. Through this project, the children took part in 300,000 Masses and prayed the rosary 460,000 times. The Victory Mass of 1942 was important because it offered the Catholic Church’s support for the war effort. Furthermore, it connected Catholicism and patriotism in a new way as it framed the war as one needed to defend Western civilization against the aggression and destruction of Nazi Germany. For more on the Victory Mass visit the archives for our scrapbook collection, which has numerous newspaper articles and ephemera on the event. Letter from Cardinal Dougherty to Parish Priest, October 12, 1942. SB-36 June 1942-Dec. 1942; 101. Catholic Historical Research Center of the Archdiocese of Philadelphia. Letter from Dougherty to Parish Priest, undated. SB-36 June 1942-Dec. 1942; 101. Catholic Historical Research Center of the Archdiocese of Philadelphia. "Solemn Pontifical Mass for Victory for Our Armed Forces Sunday, November 1, 1942 Convention Hall, Philadelphia, PA." Records of the American Catholic Historical Society of Philadelphia 53, no. 4 (1942): 203. 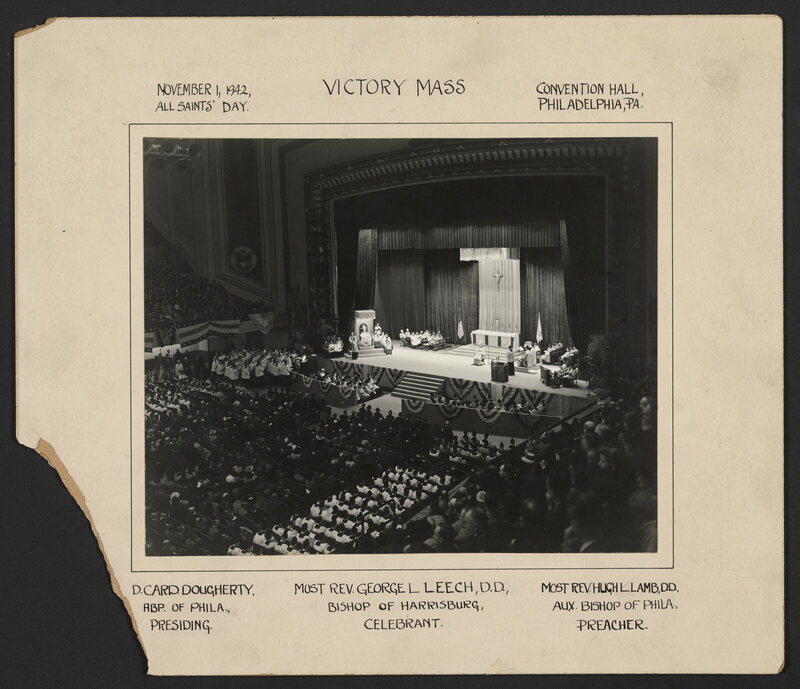 “Great Catholic Mass in Convention Hall to Support War Effort,” SB-36 June 1942-Dec. 1942; Catholic Historical Research Center of the Archdiocese of Philadelphia. Leslie White, Modern Capitalist Culture, (New York: Routledge, 2016), 257. Richard Harkness, Spiritual Bouquet Given to President,” Philadelphia Inquirer, November 20, 1942. SB-36 June 1942-Dec. 1942; Catholic Historical Research Center of the Archdiocese of Philadelphia.